It was ancient belief that, if a pelican was unable to find enough food to feed her young, she would peck at her own breast and feed the drops of blood to her young. It is because of this belief that the pelican has long been a symbol of selflessness and charity. In the 13th century, this figure became widely used in Christian art to represent Christ's voluntary sacrifice. 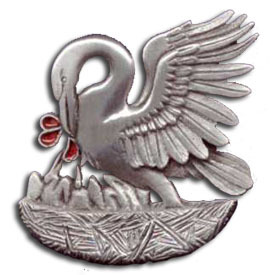 In the SCA it is the symbol of a member of the Order of the Pelican. The pin measures 2"" x 2"" and is cast from lead free pewter. For durability, the red droplets are created in resin. The back features a solid brass joint and catch pin to ensure the brooch will stay in position.